Periodic eye exams are an important part of your health. Many eye and vision problems have no obvious signs or symptoms. As a result, many patients are often unaware that problems exist. Early diagnosis and treatment of eye and vision problems are important for maintaining good vision and eye health, and when possible, preventing vision loss. What Makes Our Eye Exams Different? Did you notice the picture of the modern high tech digital refracting unit? At Modern Eyes Optometry, this digital instrument replaces the classic phoropter (the ``giant pair of glasses`` with all the dials that your eye doctor uses to determine your prescription) that was first invented in 1923. This instrument is part of our digital refracting system that ensures your prescription is exceptionally accurate. The instrument also gives us the ability to memorize your current glasses prescription and with the push of a button place your new prescription in front of your eyes in one half second! Your eye doctor will utilize a variety of tests and procedures to examine and assess the health of your eyes during your comprehensive eye exam. This eye examination may include, but is not limited to, the following tests. The purpose a patient history is to discover any symptoms the individual is experiencing and when they began. The doctor will ask about any eye or vision problems you may be having and about your overall health. The doctor will also ask about any previous eye or health conditions of you and your family members. Additionally, questions regarding medications taken and occupational or environmental conditions that may be affecting vision may be asked to specifically address your unique symptoms. This is a measurement to evaluate how clearly each eye is seeing. Reading charts are often used, however other methods of measurement are available when reading eye charts is not feasible, such as for patients who can’t respond verbally. As part of the testing, you may be asked to read letters on distance and near eye charts. The results of visual acuity testing are written as a fraction such as 20/40. When testing distance vision, the top number in the fraction is the standard distance at which testing is done, twenty feet. The bottom number is the smallest letter size you were able to read. A person with 20/40 visual acuity would have to get within 20 feet of a letter that a person with normal visual acuity would have seen clearly at 40 feet. Normal distance visual acuity is 20/20. Preliminary testing may include evaluation of specific aspects of visual function and eye health such as depth perception, color vision, eye muscle movements, peripheral or side vision, and the way your pupils respond to light. Refraction is conducted to determine the appropriate lens power needed to compensate for any refractive error such as nearsightedness (myopia), farsightedness (hyperopia), or astigmatism. Our office utilizes a modern automated instrument that automatically estimates the focusing power of the eye. With the push of a button, this automated instrument quickly provides the doctor with a starting point for your prescription and also measures the curvature of the cornea, the clear outer surface of the eye. 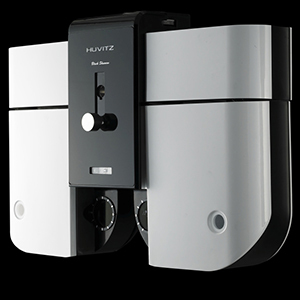 This modern instrument significant adds to the efficiency of your eye exam and provides critical measurements in determining the proper fit for contact lenses. These measurements are then transferred to our digital refracting system where our eye doctors further refine your prescription with great accuracy and precision to provide the clearest possible vision. In order to obtain a clear, single image of what is being viewed, the eyes must effectively change focus, move and work in unison. Our eye doctors will assess accommodation (eye focusing), ocular motility (eye moments) and binocular vision (eye teaming). This testing will look for problems that keep your eyes from focusing effectively or make using both eyes together. External examination of the eye includes evaluation of the cornea, eyelids, conjunctiva, and lens using bright light and magnification. Your eye doctor will then utilize a high-powered lens to examine the retina and the internal structures of your eyes. Through this thorough evaluation, your eye doctor will determine the presence or absence of common eye problems such as cataracts, glaucoma, and age-related macular degeneration. Your eye doctor is also able to examine the eyes for signs of systemic diseases such as high blood pressure and diabetes. Measurement of pressure within the eye (tonometry) is performed. Normal eye pressures range from 10 to 21 millimeters of mercury (mm Hg), averaging about 14 to 16 mm Hg. Anyone with eye pressure greater than 22 mm Hg is at an increased risk of developing glaucoma, although many people with normal pressure also develop glaucoma. Additional testing may be needed based on the results of the previous tests to confirm or rule out possible problems, to clarify uncertain findings, or to provide a more in-depth assessment. At the completion of the examination, your optometrist will assess and evaluate the results of the testing to determine a diagnosis and develop a treatment plan. He or she will discuss with you the nature of any visual or eye health problems found and explain available treatment options. In some cases, referral for consultation with, or treatment by, another health care provider may be indicated.